Eastern senior Christian Mattox (11) crosses home plate on a two-run, inside-the-park home run, breaking the scoreless tie in Monday’s Division IV district semifinal baseball game at VA Memorial Stadium in Chillicothe, Ohio. 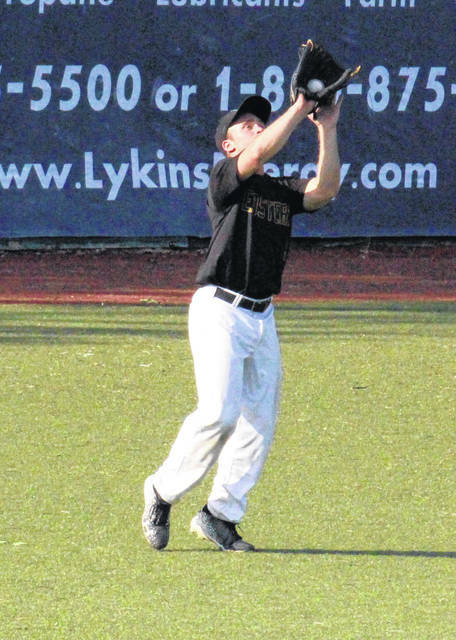 Eastern senior Josh Brewer hauls in flyball in left field, during the Eagles’ 4-0 victory on Monday in Chillicothe, Ohio. 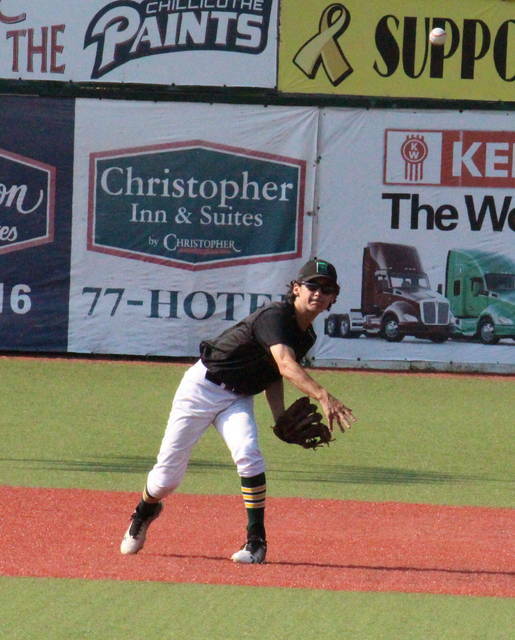 CHILLICOTHE, Ohio — A pitching masterpiece is nothing new for these Eagles. The Eastern baseball team is headed to the district final for the fourth straight year, as a complete game, two-hit shut out by EHS senior Christian Mattox led the top-seeded Eagles to a 4-0 victory over fourth-seeded Leesburg Fairfield in Monday’s Division IV district semifinal at VA Memorial Stadium in Ross County. 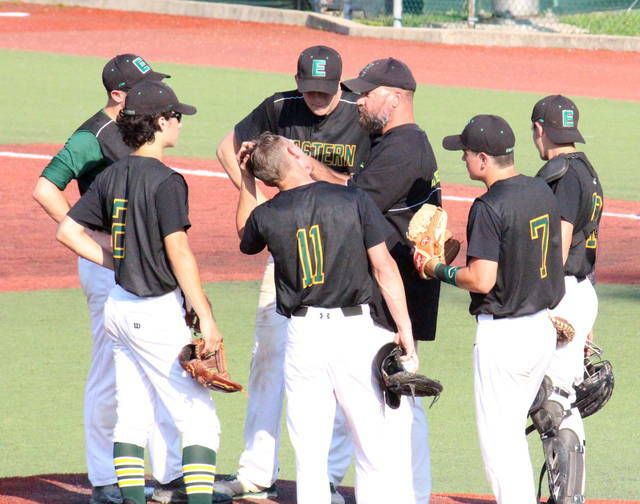 Eastern (25-2) — winner of 12 straight games — has given up just one run in its last four district semifinal games and has now won 11 games in shut out fashion this spring. The game began with back-to-back hitless frames, with Fairfield (14-12) earning the only baserunner after a walk. The Lions drew another walk in the top of the third inning, and advanced into scoring position for the first time after a one-out error. However, Mattox struck out the next two batters and EHS escaped the frame unscathed. 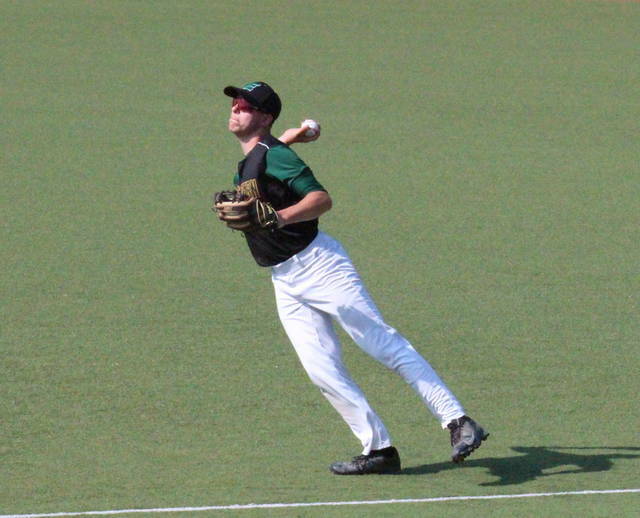 Eastern’s first baserunner of the game came in the bottom of the third, as Ryan Harbour drew a one-out walk. Pinch runner Conner Ridenour advanced to second on a balk, and then with two-outs, Mattox hit a two-run, inside-the-park home run, giving the Eagles a 2-0 lead on their first hit. Eastern doubled its lead in the following inning, after back-to-back singles by Austin Coleman and Ethen Richmond to start the frame, Coleman scored on a Kaleb Hill groundout and Richmond scored on a Matthew Blanchard sac-bunt. Mattox tripled with one-out in the following inning, but was stranded at third. The Eagles didn’t reach base again in the game. After being retired in order in the fourth and fifth innings, Fairfield recorded its first hit of the game with two outs in the top of the sixth, a single by FHS pitcher Sam Buddelmeyer. Matthew Spears led off the top of the seventh with a double for Fairfield, but the next three Lions were sent down in order as the Eagles sealed the 4-0 victory and the spot in the district final. Mattox was the winning pitcher of record in a complete game for the Eagles, striking out eight batters and walking two in the two-hit shut out. Following the game, 18th-year Eastern head coach Brian Bowen remarked on Mattox’s pitching performance, and the effort of the defense behind him. Buddelmeyer, a left-hander, was the losing pitcher of record in a complete game for FHS, allowing four runs on five hits and a walk, while striking out five. Mattox led the EHS offense, going 2-for-3 with a home run, a triple, two RBIs and one run. Coleman and Richmond both singled once and scored once, Josh Brewer added a single, Ridenour came up with a run, while Blanchard and Hill each had an RBI. Both teams committed an error in the field, while Eastern stranded two runners on base and Fairfield left five. 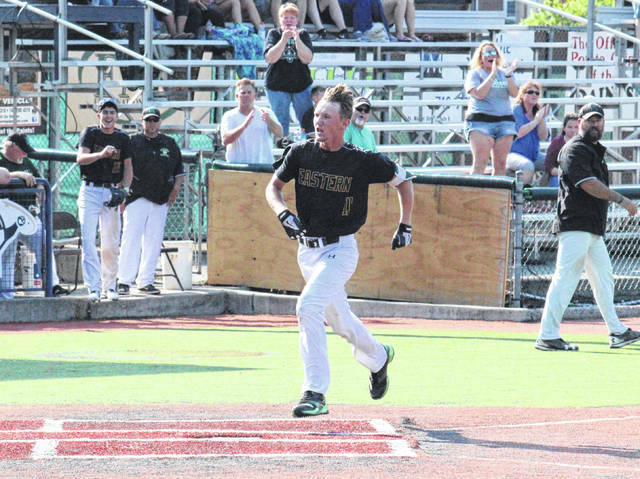 Eastern will try for the 10th district title in program history when the Eagles to return to Chillicothe on Wednesday at 5 p.m.
“Hopefully we’ll be focused and be excited for the opportunity to play baseball again,” said Bowen of Wednesday’s district final. EHS is slated to face second-seeded Portsmouth Clay, which defeated No. 6 seed Trimble by a 1-0 count in the second Division IV district semifinal at VA Memorial Stadium on Monday. It was the second time this postseason that the Panthers have advanced by a 1-0 tally. Eastern eliminated Clay from the 2017 district tournament, as the Eagles topped the Panthers 2-1 in the semifinal.